Undertaker was last seen on the 25th anniversary of WWE’s flagship programme RAW while Kane recently made a comeback in a live event. There aren’t many tag teams in WWE as popular as the ‘Brothers of Destruction’ Undertaker and Kane. The two veteran superstars are considered as one of the most dominating tag teams in the history of World Wrestling Entertainment. Undertaker and Kane have held the tag team titles three times, twice in WWE and once in WCW. The ‘Dead Man’ and ‘Big Red Machine’ have faced each other many times with the world championship on the line. The two veteran wrestlers reunited once again but this time not to create destruction inside the squared ring. Kane, real name Glenn Jacobs is running for the post of mayor of Knox country, Tennessee. 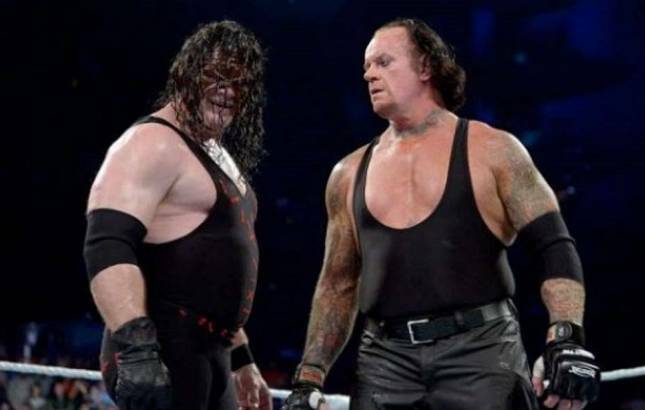 The seven feet wrestler invited his reel-life brother Undertaker as a special guest for the fundraising event. The ‘Phenom of Death Valley’ rarely makes public appearance and this was the first time the Brothers of Destruction were seen together at an event. Undertaker was last seen on the 25th anniversary of WWE’s flagship programme RAW while Kane recently made a comeback in a live event. The Big Red Monster took on Universal champion Brock Lesnar in match which lasted less than one minute. Grapevines are buzzing with the rumours that WWE may finally give fans the much-awaited Undertaker and John Cena match at Wrestlemania 34. The ‘Cenation’ leader recently ruled out the possibility of the match but you never know when things change in WWE.